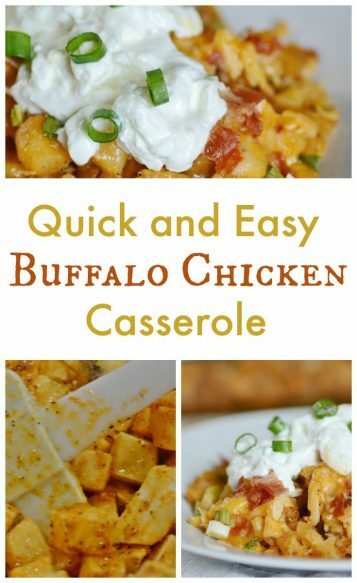 Quick and Easy Buffalo Chicken Casserole! 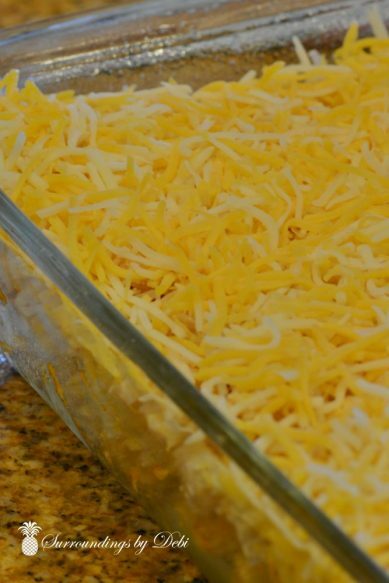 I am a big fan of buffalo chicken dip and when I recently ran across a recipe for a buffalo chicken casserole, I thought it looked absolutely delicious. The recipe looked a bit time consuming however – and if you know me, it seems I never have enough time. So I set out to make a quick and easy version. 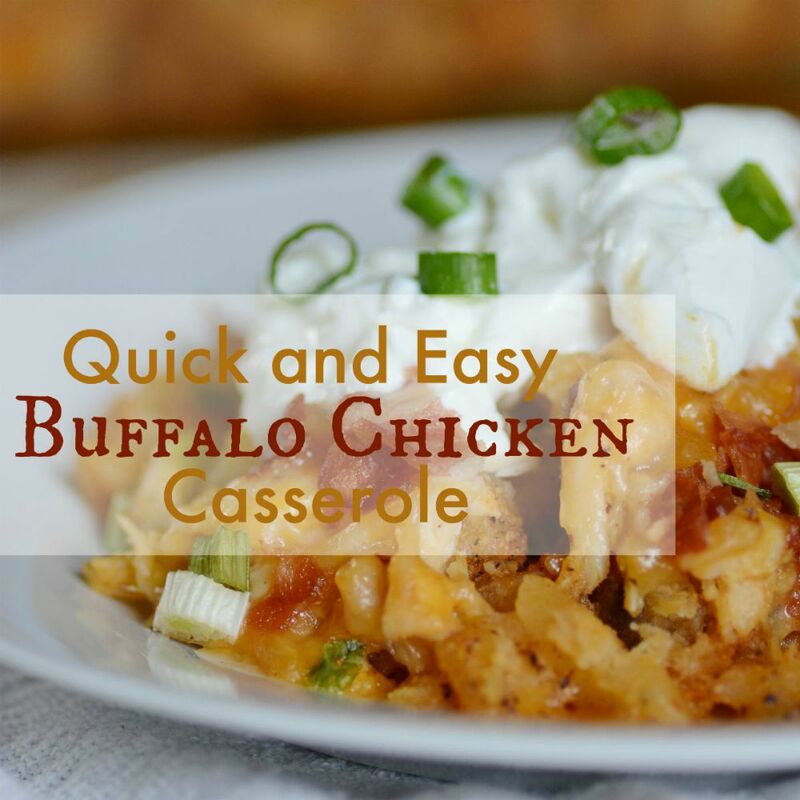 Quick and easy – my kind of cooking! It really turned out quite delicious if I do say so myself … and I guess I am. I began by setting my oven to 400 degrees and sprayed a 9 X 13 inch pan with cooking oil. In a large bowl, mix together 1/3 cup of olive oil, 1 ½ teaspoons of salt, 1 tablespoon of black pepper, 1 tablespoon of paprika, 2 tablespoons of garlic powder and 6 tablespoons of hot sauce. This smelled delicious to me just as it was! Add one bag of cubed hash browns to the mixture. Oh boy, potatoes! You know I love those. Place the above mixture into the baking dish, leaving behind as much of the hot sauce mixture as you can. Add 3 large cans of chicken, drained, to the hot sauce mixture and stir to coat. If you really love chicken, (like I do), add 4 cans of chicken! Top the potato mixture with the coated chicken. Spread 2 cups of fiesta blend cheese over the potato mixture. 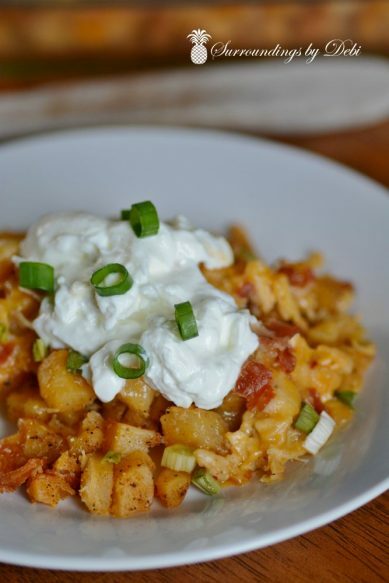 Top the cheese with 1 cup of cooked bacon, crumbled and 1 cup of green onion, diced. Place the casserole in the oven and bake for approximately 15 minutes or until the potatoes are cooked and the cheese looks hot and bubbly. This is an oh so delicious combination – especially for a cheese and potato lover like me! Topped with a bit of sour cream and a few more onions, it has become a new family favorite! If you are craving this casserole, pin it to your Pinterest board. You can see the delicious things I am pinning HERE! I often share posts at many wonderful sites. I will be sharing today at Metamorphosis Monday, The Scoop, Make it Pretty Monday , Wow Us Wednesdays and more! You can find them all HERE. 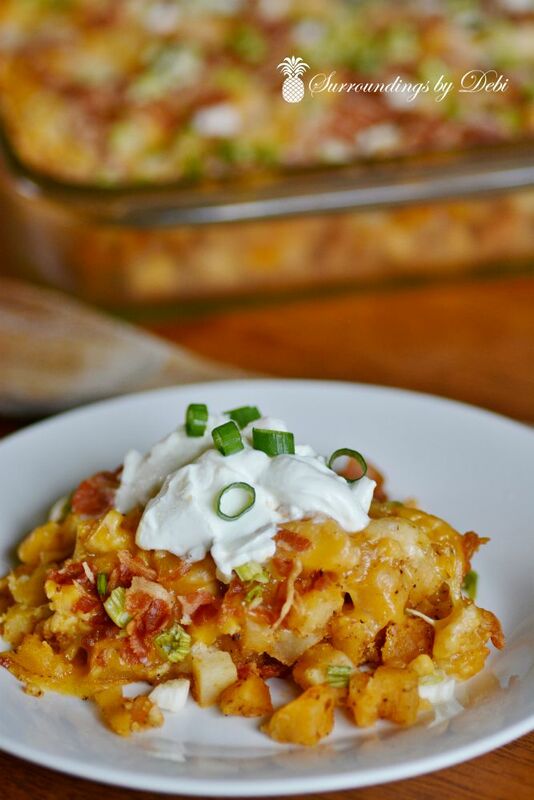 Love Buffalo Chicken Dip? - You'll love this Quick and Easy Buffalo Chicken Casserole! Spray a 9X13 in baking dish with cooking spray. 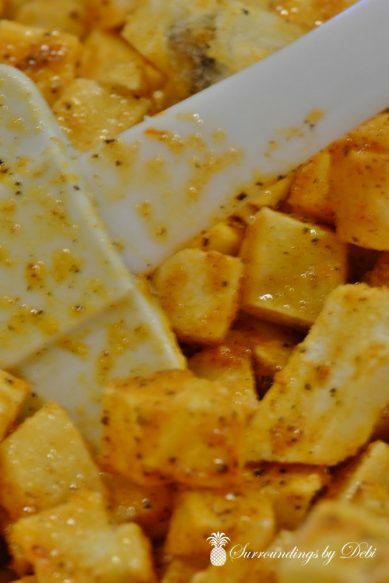 In a large bowl mix together the olive oil, salt, pepper, paprika, garlic powder and hot sauce. Add the hash browns to the hot sauce mixture. 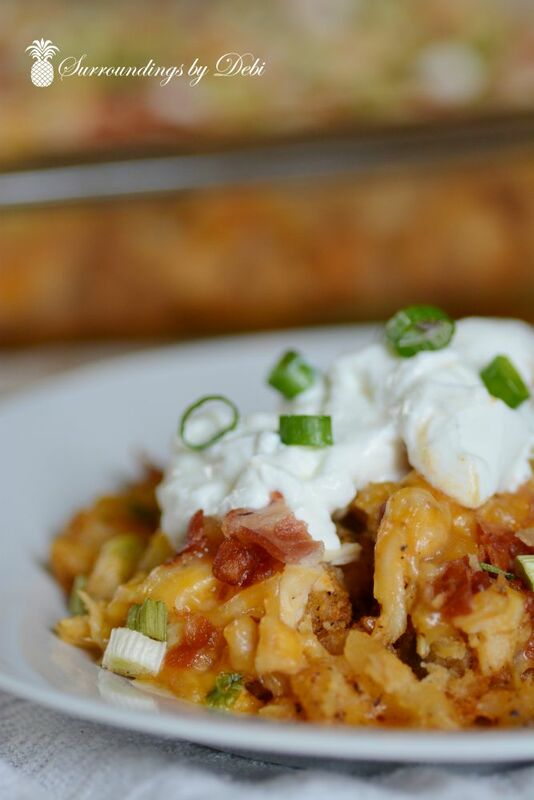 Place the hash brown mixture into prepared baking dish leaving behind as much of the hot sauce mixture as you can. Add the drained cans of chicken to the remaining hot sauce mixture and stir to coat. Layer the chicken over the potatoes. Top the chicken with the fiesta cheese. Sprinkle the crumbled bacon and diced onions over the cheese. Bake at for approximately 15 minutes or until the potatoes are cooked and the cheese looks hot and bubbly.